The tide pools at bird rock (http://californiatidepools.com/bird-rock-tide-pools/ ) has an average diversity of marine life. Start off by exploring the rocks at the base of the staircase as they have lots of limpets that seem to live way to high in the tide zone. It turns out that they are feeding on the algae that are growing on the shaded, wetter areas of the rocks. Continue on to the first smaller rock and notice all the small depressions. Each of these has a chiton, sea anemone or other animal living in it. 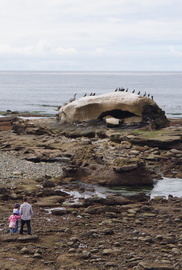 Look a little farther up on this rock to see lots of barnacles and periwinkle snails. If the tide permits, continue walking out to the larger rock with all the birds and look for the sea anemones that are dispersed on the flatter areas. Explore the larger bird rock and look at the base to see lots of different kinds of animals.